Some of you might remember back along The Fairy Hobmother from Appliances Online was doing the rounds on blog posts. Well she came and visited me this week and now she's giving you a chance to have your Christmas wishes granted. All you have to do is leave a comment below with something you've been wishing for, it can be anything (within reason of course and it doesn't have to be beauty related!) and The Fairy Hobmother will check out some of the comments and make your wishes come true! 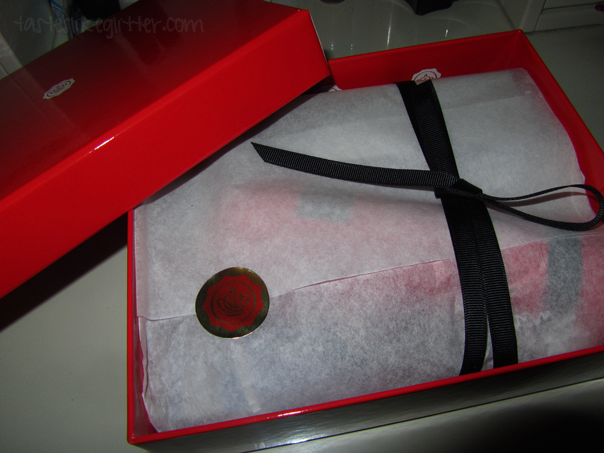 I finally have Decembers Christmas Glossybox* to show you, though I'm sure you've already seen it a thousand times over this week. I had to show you because it's a cracker (pun not intended) and I really love it! 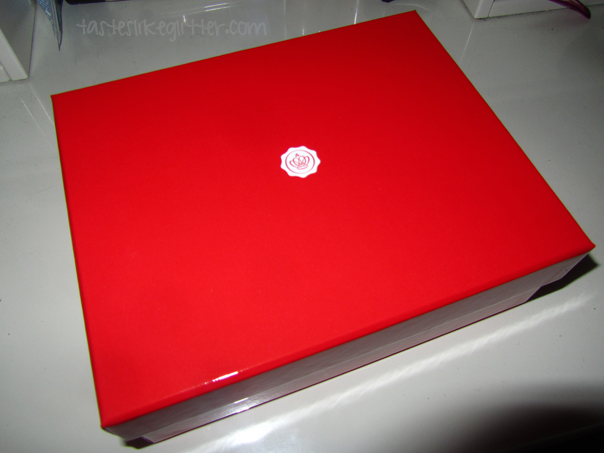 Instead of the regular pale pink and black box, it comes in a bright festive red with white snowflakes all over the inside. A wonderful full sized product. I've never used a foaming shower gel before so it was a new experience for me. I pumped a little out onto my hand and when I started lathering it in, it foamed up a lot and I really mean a lot. It's very lightly scented Indian rose and sweet almond oil, not too overpowering. It leaves my skin soft and smooth. A truly lovely product. A quick drying flake free formula. I have to agree with this. I popped it on at 5AM this morning and a few hours later I was rubbing my eyes without thinking about it. Did it flake off? Not one bit. Apparently it helps with volume too but I didn't see much of that this morning but that was only from one coat. This seems wonderful on first inspection. It's free of all sorts of rubbish. It's not even scented which is something that puts me off it smells horrible. I'm looking at you Lush Skin Drink! The amount of stress lately has taken it's toll on my face so I need to be really strict with my skin care and I need to stop touching my face. This brand is readily available in Boots. I'm hopeful that I will finally find something that does some good for my skin. I've always admired Deborah Lippmann from a far. The glitters are wonderful, especially since there is one named Bad Romance. But the chunky glitters, the thought of the removal scares me. I since found out that the company is completely vegan which surprised me but I still think it's too expensive for me to be dipping my toes in just yet. Polishes range from £14 - £18. The Stripper To Go is something I won't be using. I can't use acetone on my nails as I have a gel overlay over the top of my natural nails to keep them from breaking. Though I will say, £14 for 6 one use remover 'mitts' seems a bit steep to me. When you can pick up some pure acetone for less than a fiver and it removes glitter polishes swiftly. A non sticky lightweight lipgloss. It's very sheer, gives my lips just a hint of colour and the old MLBB. I haven't truly tested it's staying power but my going on the fact it's not at all sticky, I shouldn't imagine it would last too long on the lips. 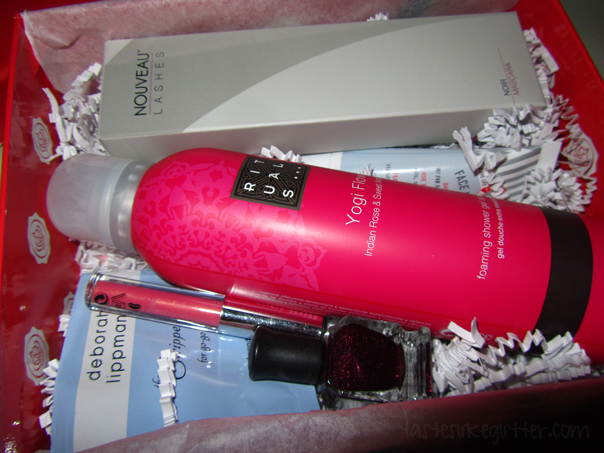 Did you get the Christmas Glossybox? Did you think it was a good one? Don't forget to make your wish in the comments below!